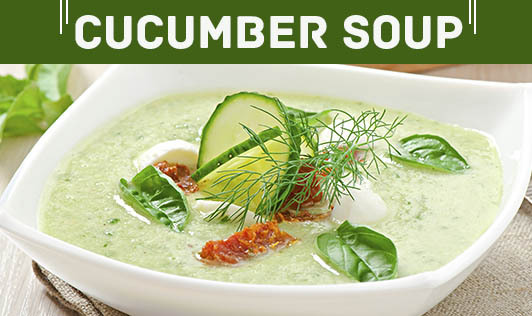 This low calorie cucumber soup is delicious and helps replenish your skin and hair. It would be perfect for the elderly as it helps maintain blood pressure, diabetes and helps in easing digestion. 1. Chop one cucumber finely. Cut the remaining cucumbers into big pieces. 2. Add 3 teacups of water to the big cucumber pieces and cook until soft. 3. When soft, blend in a liquidizer. Cool. 4. Add the curds, milk and salt and beat well. 5. Heat the butter and fry the finely chopped cucumber and the capsicum for 1/ 2 minute. Add to the soup. 6. Chill and sprinkle freshly ground pepper. 1. Pour the soup into big individual bowls and add 1 to 2 ice cubes. 2. Top with chopped mint leaves and serve.